"You're the greatest fans in the world," he said. "We owe you a championship." Shortly before the Los Angeles Dodgers tried to clinch the NL West on Friday night, they threw a party. One to celebrate Tommy Lasorda's 90th birthday. During a pregame ceremony, the Hall of Fame manager was surrounded by more than a dozen former players, ex-general manager Fred Claire, Hall of Fame announcer Jaime Jarrin and Commissioner Rob Manfred. 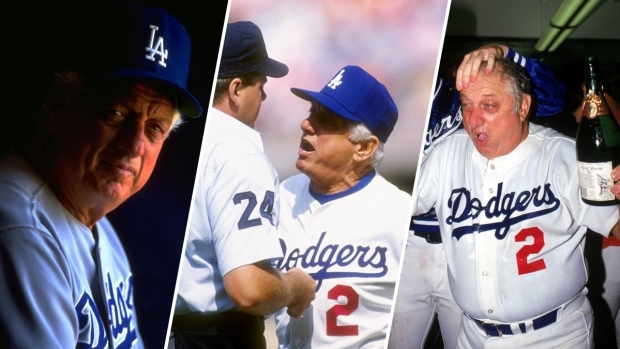 Lasorda managed the Dodgers to their last World Series championship in 1988, his second title during a 21-year run leading the club. "He's a great Dodger, a great Hall of Famer and a great American," Manfred said. Lasorda looked frail but was walking under his own power. He did not speak during the ceremony, but did briefly address the crowd after. 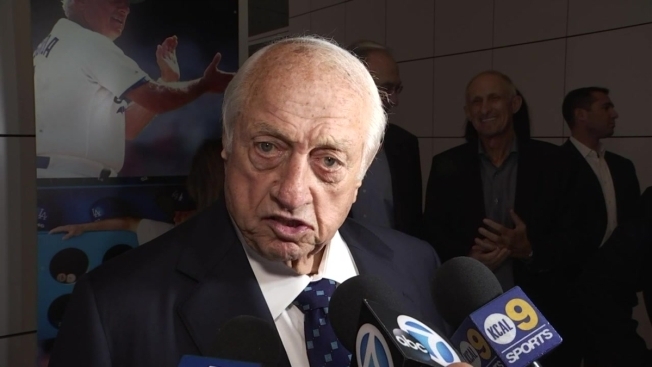 Lasorda also won a World Series in 1981 and led the U.S. to an Olympic gold medal in the 2000 Sydney Olympics. This is his 68th season working with the Dodgers, who currently list him as an advisor to team chairman Mark Walter. "He understood the talent and skill of the players and helped hone them," said former Dodgers third baseman Ron Cey. "He was like a father figure to a lot of us. He was with us all the time. We played baseball from sun up to sundown. And then we'd spend time together and eat together." The Dodgers completed the ceremony with Drew Drysdale, daughter of Don Drysdale, leading the team and fans in singing "Happy Birthday."